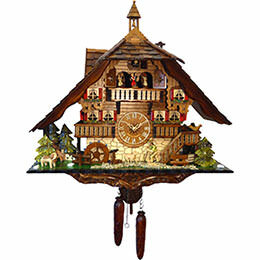 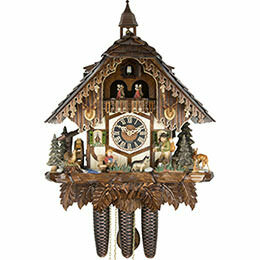 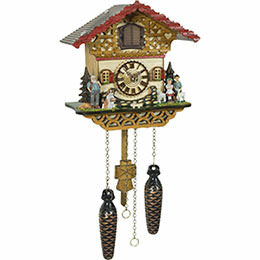 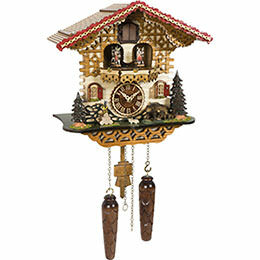 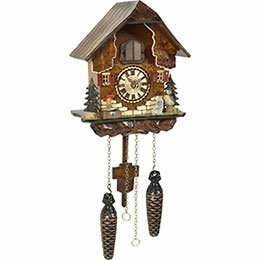 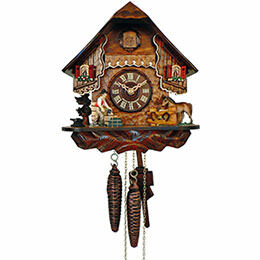 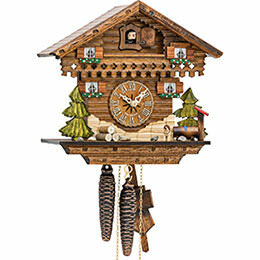 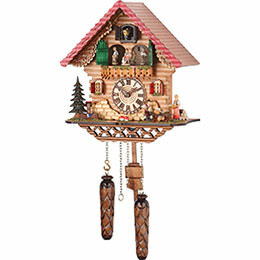 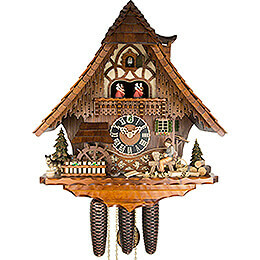 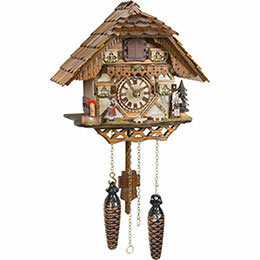 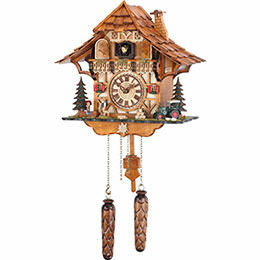 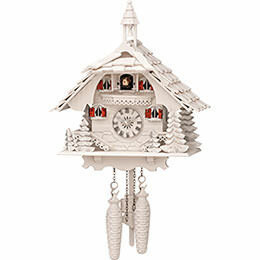 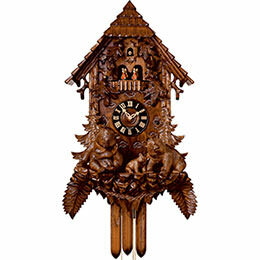 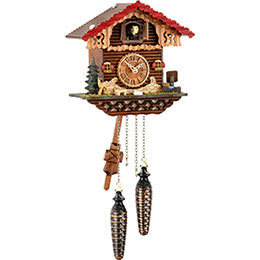 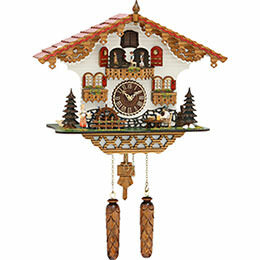 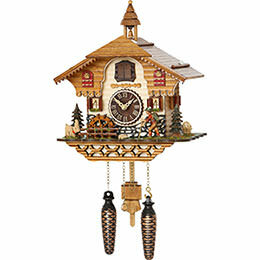 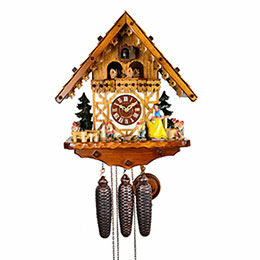 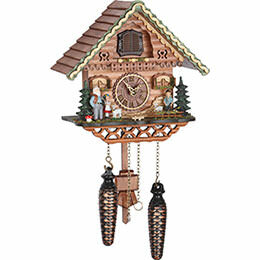 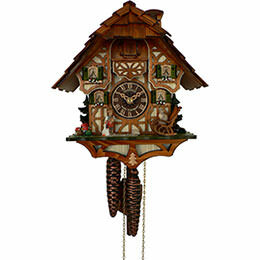 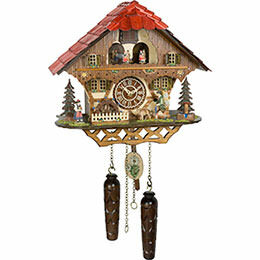 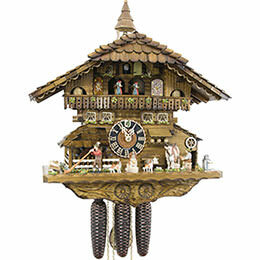 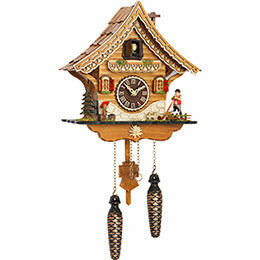 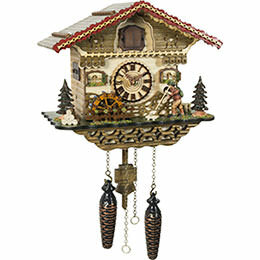 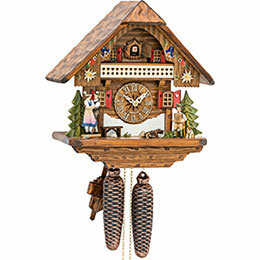 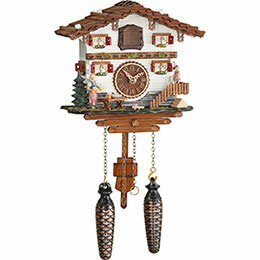 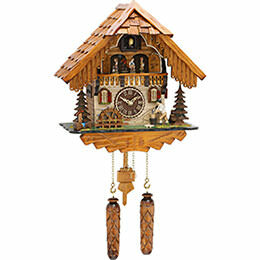 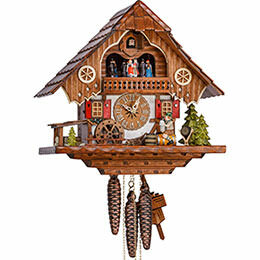 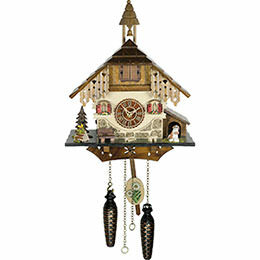 The popular chalet cuckoo clocks are miniatures of Black Forest houses. 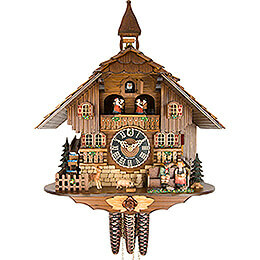 Depending on the size, a chalet clock can portray a simple hut or an entire manor. 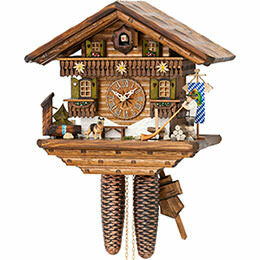 Something all of the chalets have in common is that the cuckoo lives under the roof, and comes out of his door to call. 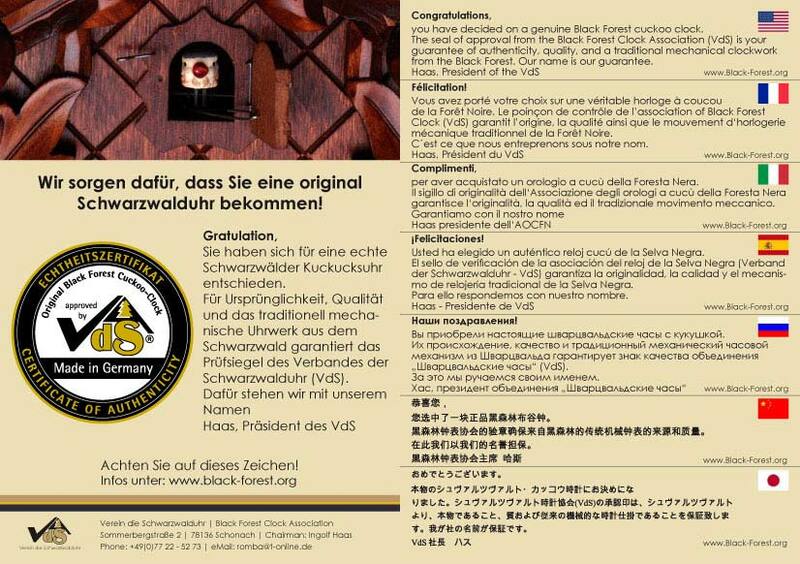 Further, there are so many versions that the right version for every expectation can be found here. 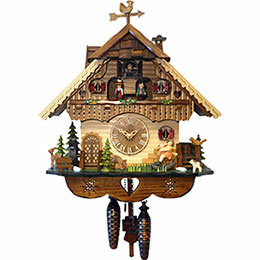 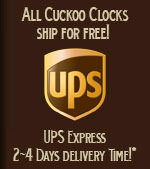 There are both simple cuckoo clocks and those with music and dancing figurines. 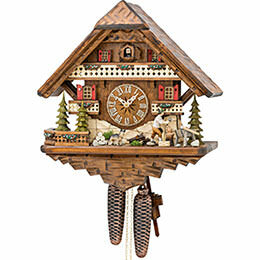 The Black Forest clock chalets are delightful, with lovingly furnished numerous individual details. 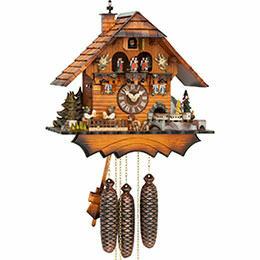 The houses are decorated with details such as shutters, balconies and roof shingles, and incorporated in a little scene. 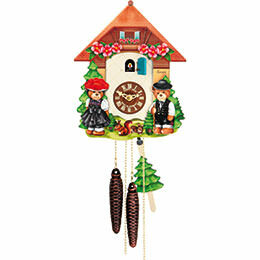 There are courtyards with wells, benches or pets; trees and forest animals suggest the Black Forest surroundings. 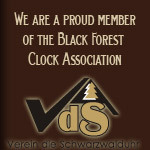 People wearing traditional apparel while working and celebrating demonstrate scenes of life in the Black Forest. 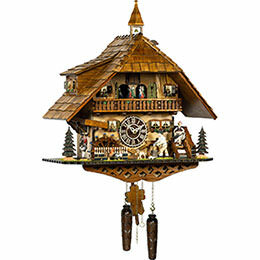 Particularly fascinating are the movable elements of some chalets that come to life every hour on the hour. 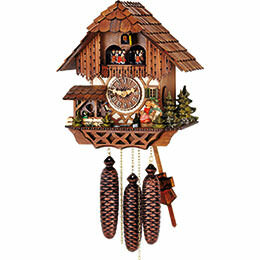 The most well-known ones are the cuckoo clocks with the movable beer drinkers. 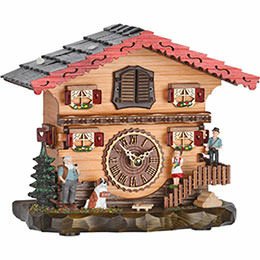 The lumberjacks at work are also a popular motif. 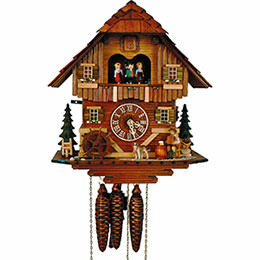 And with many chalet clocks, the house shown is a mill with a moving will wheel. 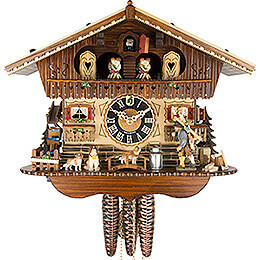 Through the years, the manufacturers from the Black Forest have generated new ideas time and again, and have incorporated a multitude of original motifs with movable figurines. 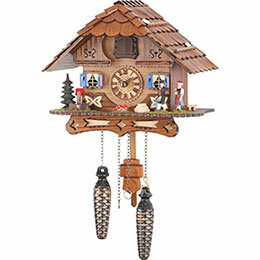 Take a journey of discovery through the world of these beautiful Black Forest houses, and let yourself be enchanted by our charming chalet cuckoo clocks.